A parish is a territorial division which can be either a civil or ecclesiastical unit. Civil parishes largely follow the pattern that was established in medieval times. Ecclesiastical parishes do not always coincide with civil parish boundaries, however. Following the Reformation in the sixteenth century, the Church of Ireland more or less maintained the pre-Reformation arrangement. 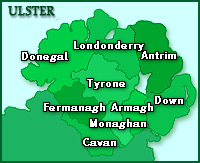 Church of Ireland parishes are, therefore, largely coterminous with civil parishes. When the Catholic Church began its institutional re-emergence in the late eighteenth and nineteenth centuries, it constructed a new network of parishes which did not necessarily follow the civil parish network.